It was the mention of Donetsk’s Kuibyshev neighborhood that finally got to me. An historian of the former Soviet Union with particular interest in labor and migration, I have been riveted by news from Ukraine these past six months. But not until I read in The New York Times that Kuibyshev was one of three districts in Donetsk that “has come under heavy rocket fire,” did my sorrow and outrage rise to the surface. You see, exactly twenty-five years ago this August, I got to know that “leafy” neighborhood with its coal mines and slag heaps, its pungent air and gritty apartment buildings, populated by families whose lives were anything but easy but who greeted strangers with incredible warmth and hospitality. To say I left a piece of my heart in Donetsk would be an exaggeration, but not a big one. I had come to Donetsk in the summer of 1989 as part of a group of labor historians and videographers to interview miners and members of their families about their lives in what was then the largest coal town in the USSR. A local travel agent had connected us with the Kuibyshev mine administration because he used to work in the district as a Communist Youth League (Komsomol) organizer before taking advantage of Mikhail Gorbachev’s perestroika and going into business for himself. We had intended to find out as much as we could about growing up and working in a Soviet mining community to explore similarities and differences with the communities around Pittsburgh, Donetsk’s Sister City and partial sponsor of our project. We did that, but we also found ourselves drawn to the recently concluded miners’ strike that had begun in Siberia but quickly spread to Donetsk and other mining towns in Soviet Ukraine. We learned that these people had endured a great deal of humiliation over the years, for which they blamed both their local bosses and those in far-off Moscow. They had put up with shortages of all kinds—even soap, a rather essential item for miners who emerged every day from shaft elevators caked in coal dust—promises long delayed or forgotten, and new uncertainties associated with perestroika. “Our leaders,” one miner said with disgust, “gorge themselves on the sweat and blood of the working class.” But, after having walked off their jobs, forming their own strike committees that issued a bevy of demands, and sitting down in the city’s main square to press those demands, they had wrung real concessions from the USSR’s Ministry of Coal—or so they thought at the time. They consequently felt empowered, as if now they could begin to shape their own lives and those of their children. 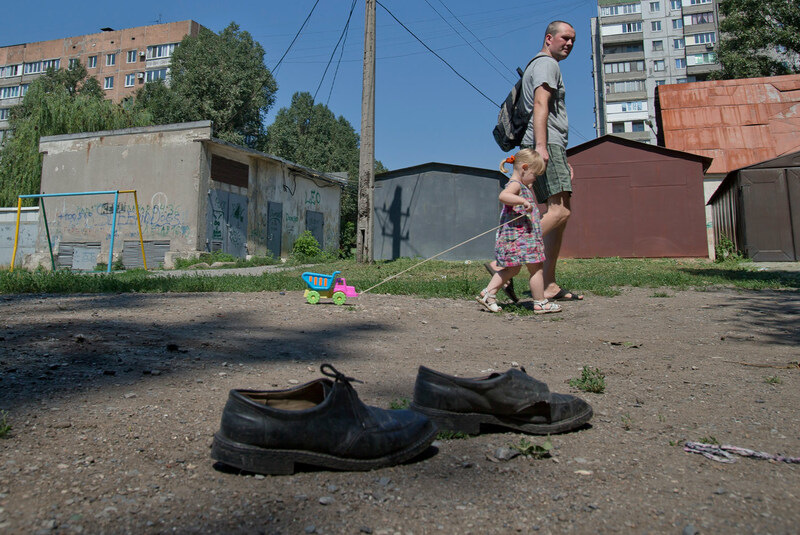 Ten months later when I returned to Donetsk and its Kuibyshev district, I discovered their optimism had vanished. It had proven more complicated to wrest control of their product and receive its “true” value than they had imagined. As the Soviet economy disintegrated, they threw their support behind an independent Ukraine, not because they shared the intense nationalism evident in the western part of the country, but because they thought they might get a better deal from Kiev. Already antiquated in Soviet times and woefully short of capital, the mining industry of the Donbass slogged through subsequent decades with little improvement in safety or efficiency. When Viktor Yanukovych, a native son and former governor of Donetsk Oblast, was elected president in 2010, things seemed to be looking up for the region that strongly had backed him. But Yanukovych failed to deliver much, and in any case, he had an unexpectedly shortened term. And so to the present war between the Ukrainian government’s army and the Donetsk People’s Republic. Sabrina Tavernise and Noah Sneider’s article in The New York Times mentions some of the casualties from the Kuibyshev neighborhood: Valentina A. Surmai, a 72-year-old pensioner; Alla A. Vasyutina, a 60-year-old cook—just two of the roughly 800 civilians who have been killed in the battle over eastern Ukraine (not counting the 298 passengers aboard Malaysia Airlines Flight 17). I was born in Ukraine and I’ve lived here all my life. My father, my husband’s father, my grandparents are buried here. I believe that no one will expel me from Ukraine…. I have been converted into a Ukrainian to such an extent that it’s no problem for me to speak Ukrainian, though very few Russians do it. Even Ukrainians themselves forgot how to speak Ukrainian.… But it’s not enough to live in independent Ukraine. My relatives, my aunt, my cousin, live in Russia and it has become a problem to go and see them. We cannot meet with each other very often, and letters don’t get delivered. Why should I want such independence? What am I independent from? During the present conflict, the Ukrainian government and its supporters have hurled many accusations against their opponents—that Vladimir Putin is masterminding the rebellion; that the Russian state has repeatedly violated Ukraine’s territorial integrity; that Russian fighters, armed by the Kremlin, have been streaming across the border; that the militias have engaged in terrorism—all of which no doubt contain some truth. But what about the truth of Tat’iana’s complicated affinities and those of perhaps millions of other inhabitants of eastern Ukraine? Will the Ukraine that emerges from this war be able to accommodate such indifference to nationalism? The complexion of the current regime in Kiev does not bode well. Tat’iana, where are you now? I hope you are safe and still so sane. Lewis SiegelbaumLewis Siegelbaum is a Jack and Margaret Sweet professor of Russian history at Michigan State University.